How many of you don’t like the vacuum? Sure, I love having a clean house but I have never liked the mess that also comes with vacuuming. Growing up, it was even worse since my mother has always used a vacuum that has a messy filter and than a bag system that was a major pain to change. In the end, vacuuming up dust usually meant I was covered in dust about every three or four vacuuming sessions, which was a really miserable experience. When my husband and I first moved in together, he had already bought a DC14 Dyson Animal Vacuum, knowing it would be better with my long haired kitty. While it has lasted over a decade, we knew it was time to upgrade since it was starting to have suction problems and we were seeing more dust, even right after washing the filter. With how well our vacuum has worked, and the power of our Dyson V6 Absolute Cordless vacuum, we knew we only had one option – upgrade to one of the new Dyson Cinetic Big Ball Vacuums. With everything I had seen online and the amazing reviews, I knew we had to try one for ourselves! Dyson Cinetic Big Ball Animal + Allergy Vacuum: What is It? Looking for the perfect vacuum to fight back against allergens and pet dander? 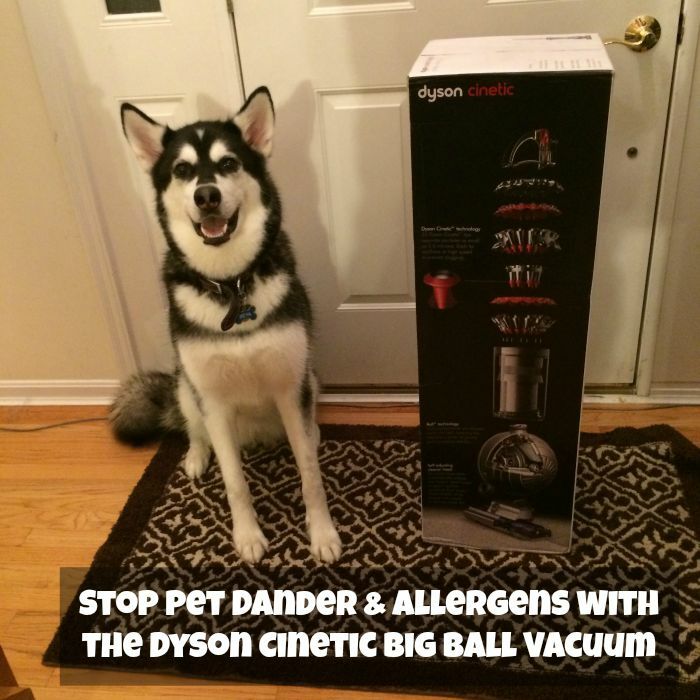 If so, we think you will love the Dyson Cinetic Big Ball Animal + Allergy Vacuum. Using the latest technology, and improved engineering knowledge that has made Dyson famous for decades, they have created the only vacuum with zero filter mainantance. No longer do you have to purchase new filters, or clean them out in your sink, creating quite a bit of mess and spreading the allergens you were trying to eliminate back around your home. Instead of using filters, they use their patented Dyson Cinetic tips which oscillate up to 5,000 Hz, separating microscopic dust out of the incoming air – the same dust that clogs other vacuums. Best of all, their technology also means that your vacuum will have the same cleaning power it did right out of the box throughout its working life. No more dealing with bad suction, or having to worry about changing your dust canister before it’s full. As well, their innovative ball technology steers easily throughout the house, allowing you to turn the vacuum easily without the use of wheels. It also has a self-adjusting cleaner head, allowing you to easily move from carpet to wood floors without any effort from you, making cleaning even easier. Of course, the most important part of all this is that it picks up pet hairs and allergens like no other vacuum on the market, allowing you to have a clean home, even with fluffy, messy four legged family members. With innovative cleaning tools, whole machine HEPA filtration, and hygienic bin emptying, keeping your house clean has never been so easy. To learn more, check out the video below! As someone who has been a Dyson fan for over a decade, I have to say I had pretty high expectations for the Dyson Cinetic Big Ball Animal + Allergy Vacuum. While all the vacuums I have tested in the past did a good job, nothing I had seen to date has picked up dog fur and dust like our Dyson DC14. It has been a true workhorse in our family and we may not have even considered replacing it if it wasn’t for seeing the cleaning power of the Dyson V6 Absolute Cordless vacuum. After assembling the vacuum (which was super easy), I couldn’t wait to get started cleaning our living room. To really test the vacuum, I didn’t vacuum our living room for two weeks, letting it accumulate fur from both of our malamutes and dirt from everyday living in our home. To say that we were blown away by the Dyson Cinetic Big Ball Animal + Allergy Vacuum is truly an understatement. It was picking up dust that our old vacuum wouldn’t have even noticed, which my husband I both thought was pretty impressive. So impressive in fact that we had to empty the canister three times from all the dust it was picking up from the carpet. I also can’t remember the last time our air smelled so…clean! Even the dogs were investigating since they thought the room smelled very different after we vacuumed. The new Cinetic technology is truly amazing and picks up dust that you wouldn’t even know existed with only one go. For people like us with two large dogs and allergies, the Dyson Cinetic Big Ball Animal + Allergy Vacuum is truly a lifesaver! As well, I also want to note that this vacuum comes with a TON of different attachments and a storage bag for said attachments. I had some of these attachments that I purchased separately for our old Dyson and I have to say that they aren’t cheap. Even with Amazon’s great prices we probably spent about an extra $200 buying half of the attachments for our old vacuum that came with the Dyson Cinetic Big Ball Animal + Allergy Vacuum. That being said, it looks like some of the attachments have been changed to make them even more functional , making dusting, cleaning fans, and overall managing a large house with pets even easier. It also wouldn’t surprise me at all if this vacuum lasts as long as our older Dyson, making it an amazing deal for the money, especially since most other vacuums I have reviewed died within two years from trying to manage Reya’s long fur. Based on our own experience, I am delighted to give the Dyson Cinetic Big Ball Animal + Allergy Vacuum an A+ rating, and very highly recommend it for any household with pets! Want to purchase this fantastic vacuum for your own home? 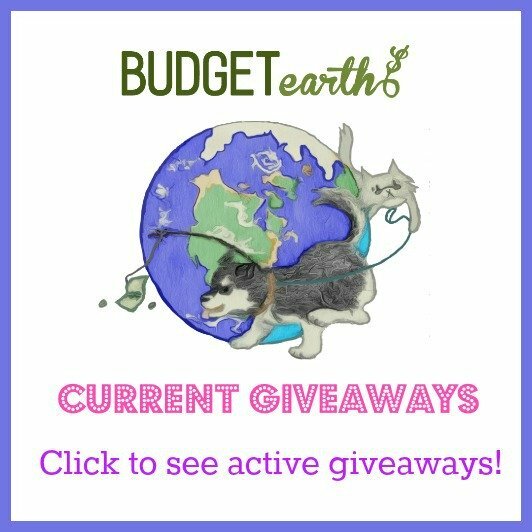 You can buy the Dyson Cinetic Big Ball Animal + Allergy Vacuum (featured in this review) on the Dyson website, Amazon.com, or use their store locator to find a Dyson retailer near you. Want to learn more & see great deals? Check out Dyson on social media! I have 4 cats and 3 dogs and they leave lots of hair around the house so it was good to read the review you wrote about how great it worked. We have TONS of shedding here with two malamutes. Twice a year they blow coat and they are starting to lose their summer coat to get that nice, big fuzzy winter coat. We had fur EVERYWHERE! I can’t believe how easily this Dyson cleaned everything up. I can honestly say I was horrified how dirty our living room carpet was and am slowly doing the whole house since it is just picking up SO MUCH! I have a question for you. I have two long-haired mixed breed dogs and their hair tangles up the vacuum’s roller. Does this happen to you with the Dyson? I figured I would ask you because both my dogs are Alaskan Malamute mixes. Thank you. With our old Dyson – yes. Since you have two malamute mixes you know all about the joys of blowing coat. Reya’s long fur actually killed two of our other vacuums I reviewed two year ago, with it actually overheating the motor. The older Dyson did the best job but we still had to about once a month take a scissor to the bottom of the vacuum and cut out the fur. So far, we haven’t had this issue with the new Dyson. The roller area is designed differently from any other vacuum I have seen and SUPPOSEDLY it is that way to prevent the fur issues we are used to dealing with. I won’t know until another few months of use but so far so good in that area. How noisy is this vacuum? I need a new vacuum that gets up cat hair as well as my hair. I also need one that isn’t so loud that my cat and I have to leave the room. 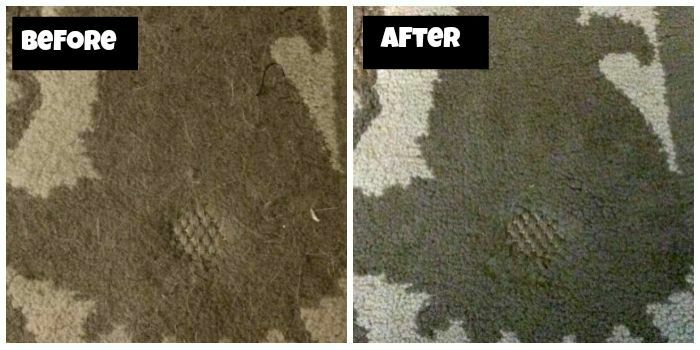 Wow that looks like a brand new rug in the after picture! Such a great review an vac. Love the before and after pictures you have shared with us. I own a Dyson vac and it’s the best. My pet Snoop and I could really use this, thanks! The sweeper I now use is bagless. I clean the cup and filter but it still seems to push more mess around than it picks up. It really should be replaced. I’ve heard nothing but good things about Dyson vacuums. This looks like it would be a great vacuum to have! This sounds like a great vacuum for me since I have 5 furbabies. Thank you for your review! This year has been tough on our allergies here. I like that this will rid of the pet hair AND the dander! I have two dogs and the looks really good. I would like to try this out. My son and I have allergies and I think this product would really help them. this is nice to see, i have always thought i had to spring for an orek to get any kind of decent vacuum. will definitely check it out. I love that there is no maintenance to this. I have an older dyson and I love it. I will have to check this one out as we have both a dog and a cat. Oh I really need one of these badly. I have 11 cats and a dog. I keep breaking all my vacuum cleaners. I bet this one would hold up. I have 4 cats, 1 dog and 2 Budgies. (Yes I have my own zoo). I need this especially when they are all shedding and the birds get mad and throw their bird seed. This is an absolutely amazing vacuum and one that I would definitely own & use. I have had several vaccuums that I have loved over the years-Hoover and Eureka. My most recent one by Shark has been the best overall. Having a dog and a rabbit require a lot of maintenance. Your review of this Dyson makes me think it would be a great new replacement brand. I love the idea of zero filter maintenance and the self adjusting cleaner head. Both are big time savers. Plus all those accessory tools make sure you get every corner and crevice! Oh my goodness! This Dyson sounds amazing and just what our home needs! I absolutely love the tangle free turbine tool on it too! Thanks for this great review. I just have one fur baby but she leaves a lot of fur on everything. I really could use this. I so need a vacuum for my house & one that cuts allergens is awesome…love, a very sneezy family! 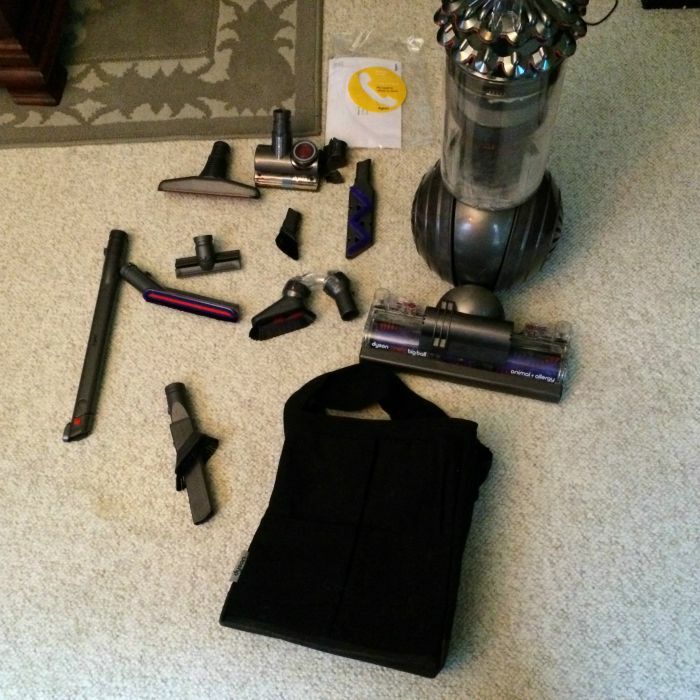 These vacuums are so awesome, we all have allergies and we have a dog (mostly non shedding, hypoallergenic dog) but still our Dyson is a must have thing! 5 cats a dog and a hairy household makess this vaccum sound great . Pet hair is thee very toughest on a cleaner. Plus it is alwaays flating around. Great review–I don’t have a dog, but my son does, and they could really use this! I love this review on the Dyson vacuum. I’m in the market for a new vacuum since my old one broke, this sounds amazing! We purchased a Dyson Animal probably 7 or 8 years ago. It still works great! We have 2 dogs and a cat, and I too have allergies! We have a Bissell Healthy Home Vac, and have been very please with it, up until the last few months. It is getting quite old, and I’ve probably gotten my money’s worth out of it. It is definitely time for me to move on. I would love to know though…. How do the attachments work on the Dyson V6? The attachment that vacuums the pet hair off of the couch is what I’m really interested in. Does the wheel thing inside of the attachment get clogged easily & stop working? Thank you!!!! I could really use this. My vacuum doesn’t pick up very well anymore. It’s getting old. It seems like I’ve had it forever. thanks for the great review, I will deffiently consider the Dyson when I purchasse a new vacuum. Dog hair is one of the toughest things to get a handle on. I like that this vacuum can handle all the hair! I REALLY WANT TO CHECK INTO THIS BECAUSE WE S ARE ALL ASTHMATICS. AND MY POOR DOG DIAMOND IS ALLERGIC TO HER SELF. I DON’T UNDERSTAND HOW A DOG CAN BE ALLERGIC TO DOG DANDER BUT SHE IS. AND WITH US LIVING IN THE BASEMENT IT GETS VERY DUSTY. NO MATER HOW MUCH I CLEAN IT GETS VERY BAD IF I LET ONE DAY GO BY. AND SOMETIMES I CAN’T GET OUT FROM BED. Looks like it works nice. The vacuum I just bought was horrible. I hate it. It throws dust back and clogs up. I read all the reviews too and went by them. Didn’t work out so well. Will consider this next time for sure. We have one dog and three cats in the house. I would truly LOVE to be able to afford one of these! Thanks for the great review on the vac. Looks like a good vacuum for people with pets. We have a dog & a cat, plus a bunch of granddaughters (11), 4 daughters & myself that get hairs on our carpet also! The carpet above looks amazing!! I hated emptying & changing the bags!! It got quite messy! Sometimes I had to vacuum the area again after doing these things!! I too had an Oreck, a long time ago. We had to order the bags. It worked nice, but the $$ started adding up! That’s about the best Vaccum for this kind of a job that I can think of. You have noooo idea how badly I want one of these vacuums!! I only have one cat, but I have horrible asthma and think this would be beneficial for me! A+ rating! Wow. That’s impressive. I love the advanced technology and no filters. I would love to try this vacuum out so glad it really worked. I have an older Dyson, and I like it but would love to upgrade. Looks like a great vacuum! Looks like it would be great to have if you have toddlers or little people too. (Stop Pet Dander & Allergens with the Dyson Cinetic Big Ball Vacuum) This would be perfect for our home to use. We have one longer haired cat whom it seems that I am always cleaning hair up after. Your before & after results are astonishing! I love all of the the tools you get with it. Wonderful review, thank you! Well, I really need a new vacuum but I’m going to have to save a long time to afford this one. It does look awesome but it just isn’t in the budget. This sounds like a wonderful vacuum. We have three dogs and a couple parrots. Talk about messy. This vacuum would work so well at my house. This Dyson looks like an AMAZING vacuum, especially since it picks up all of that hair! I could definitely use one. Thanks for the great review! This is a great vacuum for people with allergies. Pet hair can really aggravate allergy symptoms. I would love to try machine we sure need a new one. We have pets in the house and we clean several times per week. A house is not a home without pets. Dyson is such a wonderful brand, I would love to have the Dyson Cinetic Big Ball Animal + Allergy Vacuum. Thank you for sharing this review. This is a very nice vacuum. I love your nice review. So totally jealous that you got to review this vacuum. It looks wonderful! I’m sure all the attachments are great, too. Your old vacuum didn’t come with the attachments? That’s weird. Miy old one did. I desperately need to get a new one — will definitely look into this one. With a 6 year old golden that constantly sheds and a 4 month old kitten, who doesn’t shed yet, but I’m sure will, we’re gonna need something that willl really get the hair out of the carpets. I JUST WENT TO THE STORE AND PRICED THIS. BECAUSE I REALLY THINK IT’S GOING TO HELP WITH THE ASTHMA THIS YEAR WE ALL GET REALLY BAD IN NOVEMBER AND OCTOBER. TRYING ANYTHING ELSE TO KEEP US LIVING HEALTHY. Sounds like this is something we need in our house. Not only do we have two Fawn Pugs who shed like crazy (they are double coated) but both my niece and I are allergic to dogs and get asthmas. And I love that you don’t have to change the filter bags, or worry about canister. Also I love that its not a big bulky thing. I love this!! 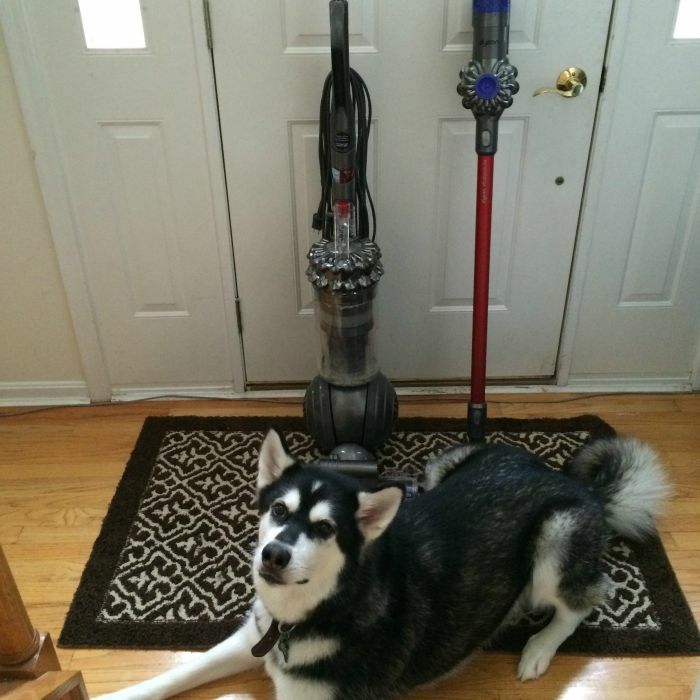 With two dogs and two cats, this Dyson will come in handy in cutting down on our dander! Love the review than you so much, learned a lot!!! Oh I need this vacuum –if its that good–with hair. Your carpet looks great.,and no bags–! I need a vacuum that will get all the cat hair up. With only one cat, still there is cat hair everywhere. It seems to float in the air and land everywhere. I’m actually allergic to cats, so this would be nice to have. We have two dogs that shed. 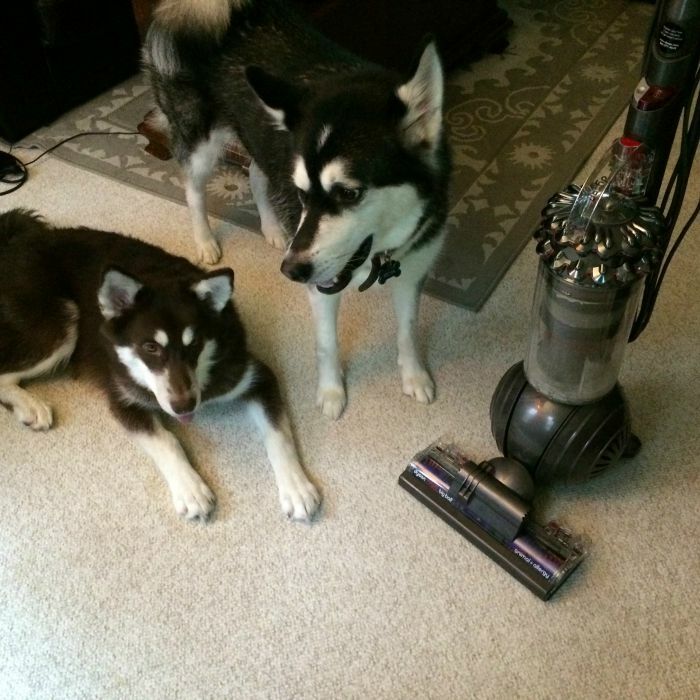 This looks like the vacuum for us!